Welcome to Valhalla Organics! We create homemade, homegrown, farm-to-table products such as preserves, pickles, honey, and more. Our natural ingredients are grown and produced on our farm or sourced from local farmers. 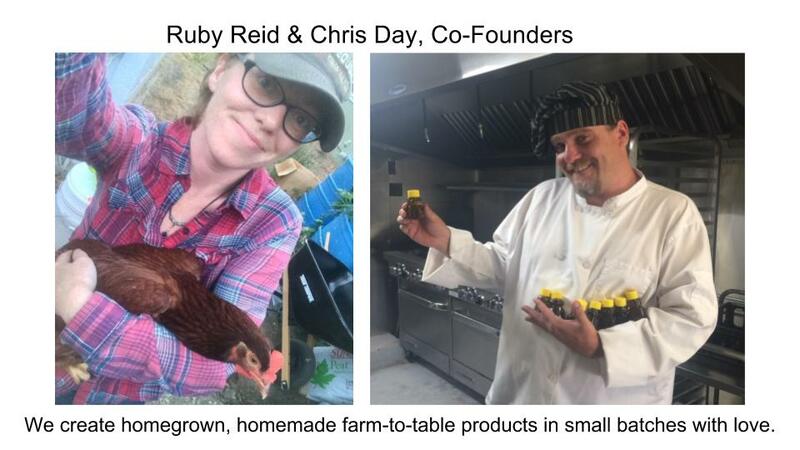 Chris and Ruby cultivated a mini-farm in a rented duplex, growing vegetables and herbs in a 20x4 foot garden bed and a greenhouse in the backyard. We raised five laying hens and we recently added five colonies of honey bees. Our mini-farm is completely sustainable. We designed closed loops for organic matter, with each component feeding the next component in an infinite cycle. We make our own jam, jelly, pickles, cheese, beer, and lots of other things from scratch -- and we love to share what we make with our friends and family. Because so many people asked to buy our homegrown, homemade products, we launched Valhalla Organics to sell our farm-to-table goodies to the public. In 2017, we purchased five acres of rural land in a secluded evergreen forest, with towering Ponderosa pine trees surrounding perfect natural clearings. It's off-grid, so we are building the infrastructure for farming, beekeeping, and homesteading on our land from scratch. We will keep you updated on our journey on our blog, Oregon Trail Sagas, and on our Facebook page. .
Our goal is to engage a larger community who support sustainable farming and beekeeping as a means to reinvent our food systems and revolutionize our world. Our homemade, homegrown goodies are available at local farmers markets and at the Oregon Cheese Cave in Phoenix. We have two great ways to enjoy our delicious homemade goodies if you live far away. Select the all natural, tasty homegrown products you'd like and order them a la carte from our Farm-to-Table menu -- or join our PICKLE CLUB to support our organic farm while enjoying homemade goodies curated especially for you. Join Ruby in our backyard and kitchen as she demonstrates how we make one of our most popular farm to table products -- in small batches with love.